Here’s a welcome change. OS X Yosemite (10.10 is a major update to a desktop operating system that brings with it almost no apparent headaches for pro audio. The normal advice applies. Backup your system before doing anything (even Apple’s Time Machine I’ve found does the job nicely). Time something major like an OS update for when you’ve got time to test, and to revert if you have trouble. (Hint: not in the dressing room before a gig.) And don’t rush to update – there’s nothing here that you immediately need for music work. But in this case, if you are trying out OS X Yosemite for other reasons – or investing in a new Apple computer (the MacBook Pros are especially nicely priced at the moment) – you may be pleasantly surprised that there a few issues. The lag in testing and compatibility is measured in days or weeks rather than months. And anecdotally, I’ve seen a bunch of people update to the new OS on recent machines and report real happiness with the results. Older hardware owners are definitely left in the dark, but it’s been a while since Apple has changed system requirements. This is what maturity looks like. Maybe some of that agony we went through in the past has paid dividends. For music, meanwhile, the main issues seem to be Avid. What once was the center of the industry these days seems out of pace; for many, many producers, the question of whether Avid is ready for an OS update has become a non-issue. There are some other glitches here and there, though. Sweetwater has a great update guide, receiving regular updates – definitely read this before updating (and thanks, Sweetwater, for saving the rest of us the work. Avid, for their part, hasn’t certified compatibility of anything they make – nothing, apart from Sibelius. Also, the presence of Avid drivers can actually break Native Instruments’ software – Maschine, Komplete Kontrol, Traktor, Guitar Rig and Controller Editor – which otherwise would work. We’ll see how quickly they can resolve these issues. Steinberg reports that their software works, but doesn’t yet recommend upgrading because of some isolated issues. The other consideration: updates are smooth if you’re on the latest-and-greatest software already, and running a recent machine. It can be altogether different if you haven’t updated other software, so it’s best to take your time and update the OS when updating other things; developers tend not to have the resources to test older updates. There are some advantages if you do update, though, apart from the general improvements in Yosemite. One enhancement developers are beginning to explore: MIDI over wireless, via Bluetooth, as seen recently on Synthtopia. It’s also easy to record video from iOS devices, useful not only to developers, but other artists and teachers, too, I imagine. I’m also curious if some intrepid developer will find a way to use iOS/desktop hand-off facilities or sharing to do something for music. 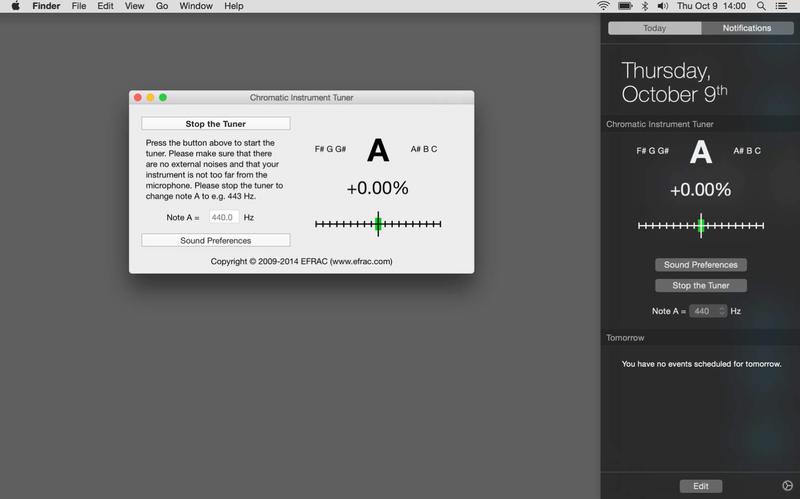 At the very least, there is already an instrument tuner available as a sidebar widget. 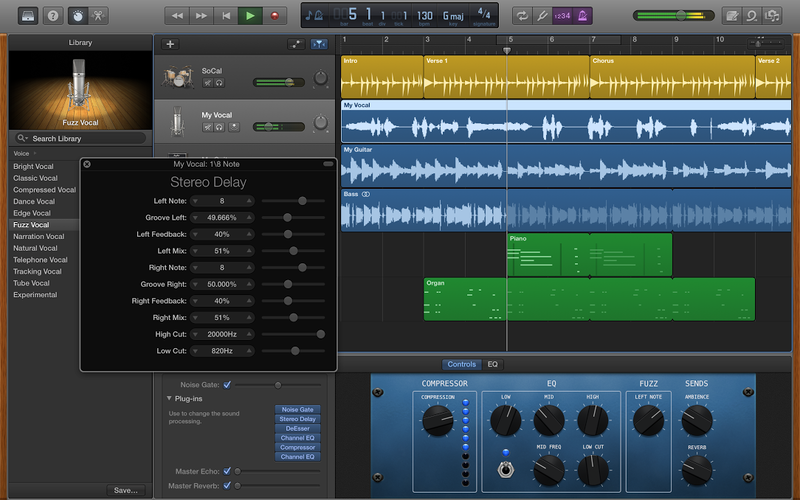 It’s also worth mentioning that Apple last month released a nice update to GarageBand. There’s lots of subtle improvements here. The Yosemite update itself is largely cosmetic. 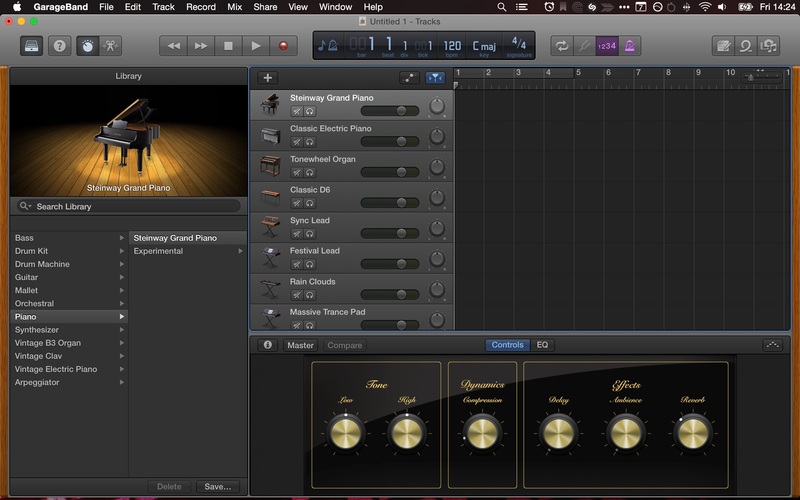 But the big one is that Apple has finally made plug-ins work the way they used to. GarageBand is important lowest-common-denominator software, stuff that’s easy to use and affordable for a broad swath of Mac users and important to many beginners, so that’s welcome news. You don’t need 10.10 to update GarageBand, so long as you have the App Store. I think there are several reasons Yosemite is going smoothly. On Apple’s side, Cupertino seems to have done a lot of work in past builds to “shake the tree” and modernise the OS, accelerating the desktop OS launch cycle but causing fewer compatibility issues. And OS X itself is simply very, very mature, even while building in new frameworks introduced on iOS (or visa versa). On the third-party side, I wonder if the success of Apple’s mobile OSes has helped train developers to keep pace with Apple software updates. Side note: I have generally admired Windows’ approach. Microsoft is extremely conservative about release candidates, freezing features well before launch, and radically committing to backwards compatibility. And on Linux, it’s uncommonly easy to install and revert updates, as well as to depend on differentiation between stable and experimental code, though that has had less impact on desktop software for music.